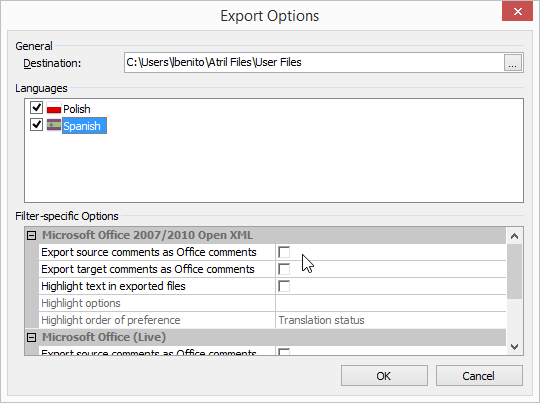 When you ask Déjà Vu to export a project, or even a single file from a project, the Export options dialog automatically appears. 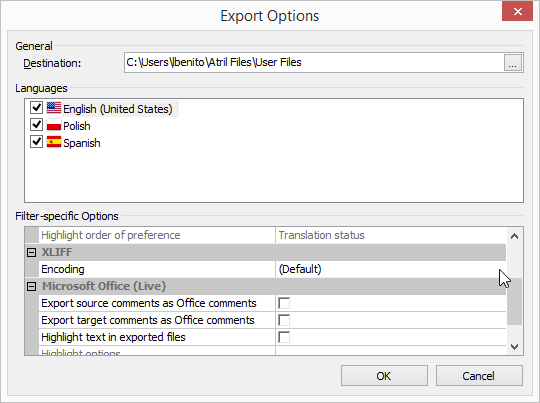 In this dialog you can select which of the existing target languages you wish to export, and you can also modify the filter options that will be used to export the documents; this customization is done for each language. Here, you can see an Export options dialog for a project that contains several files, that use different filters, and two target languages. 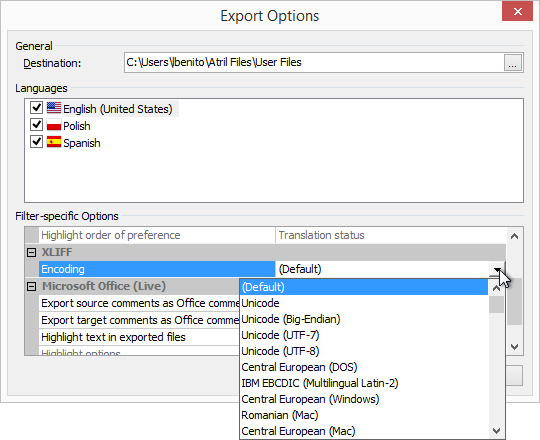 By default, Déjà Vu marks all target languages for export, but you can uncheck some of the languages if you aren't ready to export translations in those languages yet. If you want to change the filter options, you must first click on a target language to select it, and then you will be able to change the options shown in the lower part of the dialog, labelled Filter-Specific Options. You can scroll up or down to see all the different sets of options available for each different type of document you will be exporting. Doing this will cause a small button to appear. Clicking on that button will cause a list to appear, and you can then scroll through the list to see all the available options, and click on one of the items to select it. When you are done, click OK to go ahead with the export, or Cancel to go back to the project.